I finished three paintings from my recipe collection and listed these in my Etsy Store. The two lower cupcakes are a couple that I had painted before, but as mentioned in my previous post, I need to re-paint all of my cupcake paintings that were photographed before I got my new camera. In order to make larger prints they need to be shot with a higher definition camera. 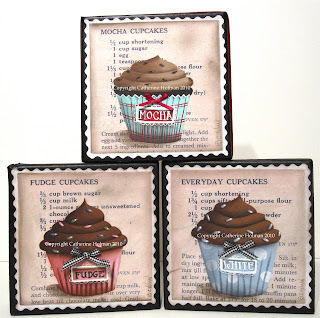 The Mocha Cupcake painting is brand new. All three have black and white checked ribbon wrapped around the edges. After painting these yummy cupcakes I decided to "clean out the frig". I don't mean that in a good way either. I ate the leftover cheesecake, the leftover chicken enchilada casserole, drank the last Pepsi.....you get my drift. This time of year I always want to lose a little weight so I can fit into my summer clothes and instead start eating like it's my last meal. Here's a suggestion: " If you are trying to lose a little weight before summer gets here, don't clean out the frig!" Any suggestions for losing a few pounds for a gal who sits around painting cupcakes all day? Not a one! It's a miracle that you're doing so well...you look like a wee bit of a thing to me! I really like the cupcakes against the recipe. Looks so beautifully "layered." Your cupcake trio is adorable! I'm afraid I ask for suggestions on how to lose weight, and then I have a cupcake. Life is too short to not eat cupcakes. 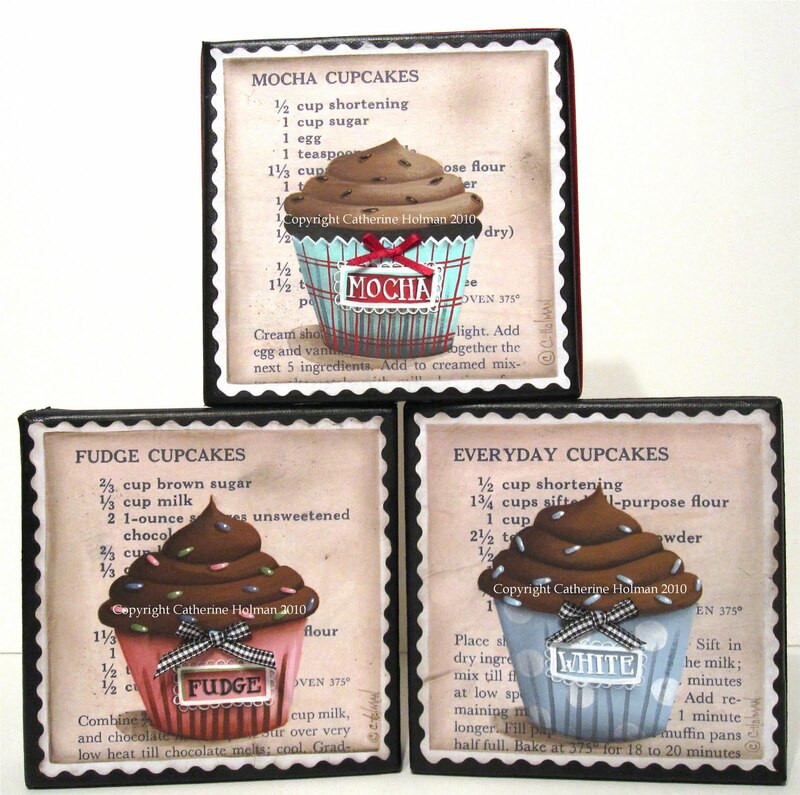 I love these cupcakes against the recipe background! Keep up the wonderful work! I love the cupcake recipe collection! They're adorable. Maybe you could paint salads. Or...ummm....cherry tomatoes! They are adorable as always! So was this post! HIIIIII!!!!! How are you?! I never stopped by to say hi and thank you for following and for your sweet comment!! !